Ali has been an IT Professional for the last 15 years working at various Engineering, Management and Senior levels in the areas of Project, Service, Audit and Technical disciplines. Ali holds a Chartered IT Professional and Fellow status from the British Computer Society. He is also certified in Microsoft, PRINCE2, ITIL, Risk Management, Information Systems Audit, AGILE and Business Analysis. Currently Ali runs an IT Consultancy firm and is a Board member of the Information Systems Audit & Control Association. Ali has also been involved heavily in community services working with a number of religious and community organisations. He is voluntarily working at the local Islamic Centre Sunday School teaching Akhlaq for the past 2 years and is also part of the School Management team. Ali also designs websites for quite a few charities and provide training and career advice on IT and Business subjects to the community. Dr Ehsan is a qualified A-level teacher, teaching Physics and Mathematics at the Preston Manor high school. He obtained his PhD in Solar physics from the University College London where he had graduated with a Master in science degree in Physics. He has been an active member of the community and volunteered in various successful projects. He was one of the pioneers and organisers of the Love Muhammad campaign in the UK that started in 2014. 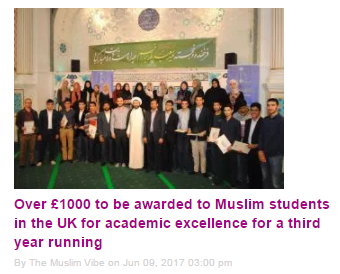 Dr Ehsan has also been on the Islamic Student Association committee (Kannon Towhid) on both the UK and the Europe committee. Dr Leila graduated with a first class honours degree in Psychology, and completed her PhD in medical education at the University of Leeds. She currently works as a Research Associate in the medical school at University College London. Leila works with the General Medical Council on a multi-million pound project that seeks to understand poor performance in medical doctors. Her other research interests include training doctors to make the best clinical decisions and helping patients make good informed choices about their health. She has published her research findings in peer reviewed journals and regularly presents at conferences and seminars. Besides research, Leila lectures and tutors medical students. She is passionate about helping women do well in their chosen careers and sits on the Gender Equality committee at UCL. Leila is part of a mentoring scheme in collaboration with various London universities and is currently benefitting from having a mentor herself. She truly values the mentor-mentee relationship and believes everyone needs a mentor to achieve their full potential in their professional and personal lives. Pardis is studying for a her master degree at the University College London in Biomaterials and Tissue Engineering. She completed a Master of Engineering degree in Medical Materials from Queen Marry University. Pardis has been an active member of AhlulBayt Societies and the MSC (Muslims Student Council) and served as the Secretary and educational trips organiser for students to Iran, Germany and Tanzania. Pardis has also been Involved with Islamic Student Association (Kanoon Towhid) organising educational, cultural and political events. She thinks mentoring is a rewarding and valuable role, she hopes to make a difference to someone’s life through the A. T. Award mentoring scheme, by guiding and nurturing their career quest. Dr Abbas is a medical consultant and specialises in palliative medicine. He has extensive experience as a medical doctor and a community leader which has led him to establish number of faith and clinical forums. Dr Abbas started working in Palliative care in 1999 and then was involved in start-up of a hospice in Essex. This experience has enriched him with observations and involvement in people’s development. He is passionate about providing leadership and development experience to medical and other clinical colleagues. For that purpose, he regularly lead clinical reflection meetings at hospice. He wishes for junior doctors to develop and have focussed experience to develop a passion about their roles. That will in turn help healthcare services in general. From a religious perspective, he hopes that they can see a role model in all their mentors from academic, social and spiritual perspective. I am currently a fourth year medical student studying at Imperial College London. I’m an active member of the Ahlulbayt society at Imperial (being the current Treasurer) as well as being on the conference/promotion committee for the Imperial College Neuroscience Society. I take part in the Saving Londoners Lives scheme, teaching pupils basic life support, as well as giving medicine tutorials to students in the year below me, providing me valuable teaching experience. For enjoyment, I like traveling and am passionate about sports, having played a range from football, tennis, cricket, table tennis, swimming and martial arts in my life! Zahraa is a recent BA Architecture graduate from the University of Westminster. Over the three years of her study at university, she has accumulated knowledge and practical use of various programs and softwares such as Photoshop, Illustrator and AutoCAD. She has also designed many posters and graphics for Ahlulbayt Societies and many other social media pages, such as AIM Islam. Zahraa is an active member of the community and is involved in charity work and volunteering, for organisations such as IHRC (Islamic Human Rights Commission). She passionately holds education dear to her heart and understands the importance of guiding and nurturing students during this crucial period in their academic lives. Through this mentoring scheme, she aspires to effectively advise and help students build the right mental framework and motivation that can help serve them in actualizing their true potential. Yasir has recently moved to the institutional real estate sector, where he works with a team developing large, residential-led schemes in regional UK cities. Prior to this, he spent five years in Investment Banking, advising clients on corporate finance matters, including company disposals, mergers & acquisitions. Yasir studied Economics at University College London and has been involved in multiple mentoring schemes both at university and during his professional career. He hopes that his experiences can be useful in providing guidance and support to students of our community.